While many teams are infatuated by the likes of Dustin Brown and Rick Nash, the Detroit Red Wings are looking to just tinker with their roster as Monday’s trading deadline approaches. The Red Wings, currently second in the Western Conference with 85 points, like their roster as currently constituted, but may be in the market for a depth player on the fourth line. 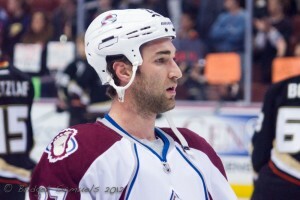 Of course, the Wings already have been involved in one deal, acquiring defenseman Kyle Quincey from Colorado (via Tampa Bay and old friend Steve Yzerman) for a first-round pick. And they solved their backup goalie problem in-house, as Joey MacDonald proved to be more than up to the challenge when Jimmy Howard went down with a broken finger. With those two sore spots being shored up, the one area the Wings could use some help is with its depth. Coach Mike Babcock said that an injury to the dependable Patrick Eaves (concussion) has challenged Detroit’s depth on the bottom six forwards, and if the right move is there, he thinks the team will make it. The list of forwards who fit that description is pretty small, but includes the likes of Paul Gaustad (Buffalo), Travis Moen (Montreal), Steve Ott (Dallas), Mike Knuble and Jeff Halpern (Washington), Brian Rolston (Islanders) and Samuel Paulsson (Carolina). being a guy who can play well in all three zones. In addition, he would add some versatility, as he can play wing or center, and is a good face-off man. 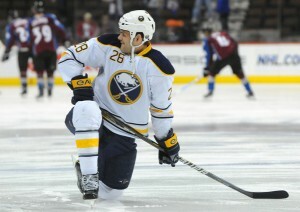 He has 7 goals and 10 assists with the Sabres this year, but has played well in a rough season for Buffalo. Moen is a similar type player, though not as big or as skilled as Gaustad. However, he has an incredible work ethic and is great at killing penalties. He has 9 goals and 7 assists on the season with the Canadiens. Halpern can play center or wing, is an excellent penalty killer, and a solid leader. He also would look good on Detroit’s fourth line. Knuble and Rolston could also be interesting, but the Wings really do not need the veteran presence either would provide, as they have quite a few guys who fill that role now.